Saturday featured a great matchup in Division-II. The Milford Spartans squared off against the Windham Jaguars. Both teams were 3-1 heading into the day’s action. Mitchell Banuskevich (#7) was extremely effective early on for the Spartans. After a 37 yard rush set his team up with first and goal, Banuskevich took the handoff from QB Harrison Urda and raced in for a 4 yard touchdown. PAT was good. Milford leads 7-0. It didn’t take long for the Jaguars to respond. On their first play from scrimmage QB Brendan McGinnis ran a beautiful play-action fake. He rolled right and saw Anthony Gallo wide-open cutting across the field. With no one near him Gallo caught the pass and easily scored on the 65 yard pass play. What a way to start the game. With eight minutes remaining we’re all tied, 7-7. On the ensuing drive it was more Banuskevich slicing through the Jaguars defense. He found space off the left side and took the ball all the way for a 41 yard touchdown. The blocking by that left side of the line was great all game. Milford tried a fake extra point kick, but the conversion was unsuccessful. Score stands at 13-7. 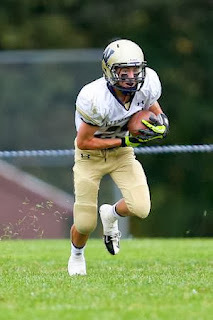 A great return by Shane Lafond set up Windham with excellent field position at their own 45 to start the next drive. Facing a third down and 2, Brendan McGinnis went to the hard count and drew Milford offside extending the drive. On the next plat he hooked with Joey Frake for 37 yard catch and run up the right side. Two plays later Lafond would take the ball in for the 2 yard touchdown run. PAT no good. We’re all knotted at 13 as the first quarter comes to an end. Starting at their 35 Milford was able to respond again with great rushes by Banuskevich and Evan Perron. Both runners are an integral part of the Spartan run game. They seemed to gain over 5 yards on every rushing attempt in the first half. With the ball quickly advancing down the field it was Banuskevich punching it in for his third TD of the game. PAT good. Milford leads 20-13. After adding a field goal Milford had a commanding 23-13 lead entering the fourth quarter. With three minutes already gone by it was time for the Jaguars to start their comeback. Facing a fourth and three deep inside Milford territory the Jags went for it. I was expecting a run play to try and pick up the first, but McGinnis dropped back and connected with Anthony Gallo for a 33 yard TD. They made their 2-point conversion and were now only trailing by two. The Windham defense came up huge in the second half. They found ways to contain the running of Banuskevich and Perron. Milford went three and out of their next possession and had to punt the ball away. Two plays later it McGinnis threw a pass out to his right connecting with Joey Frake. Frake looked as if he would be forced out of bounds, but he evaded two Milford defenders and scampered down the sideline for the go-ahead 70 yard TD. Windham takes their first lead of the game with just over six minutes remaining in the game 27-23. It was time for the Jaguars defense to step up again. With Milford driving deep inside Windham territory Harrison Urda was sacked and fumbled the ball turning it back over to the Jags. He would get the ball back with 1:19 remaining in the game, but after a sack on first down Urda threw the ball over the middle and it was intercepted by Kellin Bail. Comeback complete. Final score Windham: 27, Milford: 23.